Landau (pop. 22,870 in 1950s, 41,821 in 2007), formerly a free city under French occupation 1648-1816, then a fortified city in the Palatinate, Germany (coordinates: 49° 11′ 40″ N, 8° 7′ 1″ E). There was very probably an Anabaptist group here as early as 1526, to whom Hans Denck brought a letter of recommendation from the Strasbourg Anabaptists after his banishment from Strasbourg. Johannes Bader, the reformer of the city, was probably not aware of their presence before his disputation with Hans Denck. At Bader's advice the council decided to expel the Anabaptists from the city. Early in January 1527 an order was issued to all the guilds, making it a criminal offense to harbor Anabaptists. In the same month the mayor notified the authorities that "Jakob Kremer has a maid who was baptized at Rott near Weissenburg (Alsace) about three years ago." On 26 April 1528 Georg Brauner, Wolf Hitschler's son-in-law, Master Lorenz, Peter Hammer, and Stoffel Lauinger with his wife and children were banished. Shortly before Pentecost in 1528 many men, women, servants, and maids were questioned by the council. Most denied any Anabaptist leanings; they were admonished to abstain "from Anabaptism and secret mutiny." Those who confessed Anabaptist connections were ordered to leave the city. The banishments continued. Johannes Bader wanted to hold a disputation with them, but was refused. After Bader's death the suppression continued. In 1556-1558 all Schwenckfelders and Anabaptists were banished from the city. In 1582 again they were driven out. Yet the Anabaptist movement succeeded in maintaining itself in secret. In 1591 the Landau congregation signed the Concept of Cologne. Nothing further is known of it. Gelbert, J. P. Magister Johannes Baders Leben und Schriften. Neustadt, 1868: 181 ff. Hege, Christian and Christian Neff. Mennonitisches Lexikon, 4 vols. Frankfurt & Weierhof: Hege; Karlsruhe: Schneider, 1913-1967: v. II, 608. Hege, Christian. Die Täufer in der Kurpfalz. Frankfurt, 1908: 15-21. Medicus, E. F. H. Geschichte der evangelischen Kirche der bayrischen Rheinpfaz. Erlangen, 1865: supplementary volume 25 and 27. Neff, Christian. "Landau (Rheinland-Pfalz, Germany)." Global Anabaptist Mennonite Encyclopedia Online. 1957. Web. 24 Apr 2019. http://gameo.org/index.php?title=Landau_(Rheinland-Pfalz,_Germany)&oldid=145674. Neff, Christian. (1957). 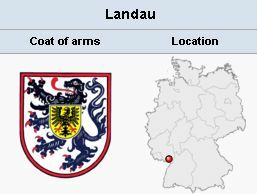 Landau (Rheinland-Pfalz, Germany). Global Anabaptist Mennonite Encyclopedia Online. Retrieved 24 April 2019, from http://gameo.org/index.php?title=Landau_(Rheinland-Pfalz,_Germany)&oldid=145674. Adapted by permission of Herald Press, Harrisonburg, Virginia, from Mennonite Encyclopedia, Vol. 3, p. 279. All rights reserved.